When Lyon’s wizards try to destroy the village, Natsu manages to blast the acidic jelly away from at least the center of the village. Natsu fights and beats Yuka and Toby, while Lucy fights and defeats Sherry. Erza catches up to Lucy, Gray, and Happy, with the intention of bringing them all back to the village. Gray’s determination convinces her to stick around to help. Gray tells Lucy and Erza about when he and Lyon were students under the wizard Ur, and how she sacrificed herself to save both of them. Lyon plans to thaw Deliora, the one foe Ur couldn’t defeat, in order to prove that he is stronger than his old master. When Gray confronts Lyon, he goes in with the intention of sacrificing his life, but Natsu convinces him not to do so. The volume ends with Lyon stabbing Gray with an ice sword. While this may not be my favorite arc, Natsu’s fight against Yuka and Toby was the moment that I became a fan of Fairy Tail. 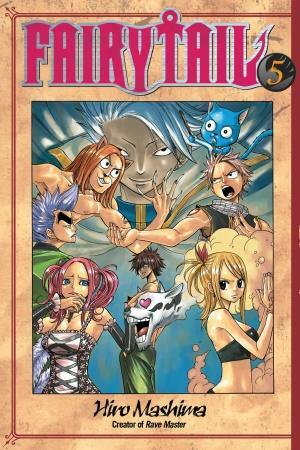 It showed that Mashima had a fresh style when it came to fights. Sure Natsu used pure shonen conviction to defeat Yuka, but his win over Toby was all genius comedy. It was a short fight, but it left an impression on me. Lucy’s fight against Sherry was great too. I like how Mashima is including her in the fight roster with every arc. This was the first time that she got a proper one on one fight that she finished herself, and it showed me that Mashima intended to give equal opportunity to his characters, no matter their gender. Far too often female leads either don’t fight, or their fights are hardly the best of the series. Either way their portrayal biases fans against her (a good example of this would be fans of Bleach dismissing Orihime because she didn’t get any good fights). Lucy may not be the greatest fighter, but this fight was all her own, and she finished it on her own terms. She isn’t relegated to the damsel in distress role, and I can respect Mashima for that. Erza’s introduction into the story is a good example of Mashima’s good humor. I may not care for Toby or Sherry, but Happy’s reaction to Erza was priceless. As I’ve said before, when Mashima is good he’s great, and this was an example of him being great. Gray’s backstory was a lot of fun, it explained everything it needed to, though I do feel that the emotional impact wasn’t quite there for me. Perhaps it’s because I’ve read this series so many times, but Ur sacrificing herself wasn’t quite the tearjerker it was supposed to be. I was also going to make a joke about how Ur losing her leg was copying Shanks losing his arm. Except the two are completely different. It’s actually more like Zeff losing his leg. On Del Rey’s end there was at least one case of poor editing. On the last panel of page seventy two they put Lucy’s dialogue in Aquarius’s dialogue bubble and vice versa. I only bring it up because I myself am an editor (currently freelance) and I tend to notice these kinds of things. I can’t say I know how the editing process works in a manga licensing company, but this seems like the kind of thing that should have been picked up on. Then again, I didn’t find any other mistakes, so overall the editing was well done. The only other thing worth mentioning is the coloring page at the end of the book. I always laugh when I see these. I can’t imagine any manga fan would actually color the page, and photocopying the page would just damage the spine (trust me, I’ve tried). So it seems ultimately pointless. As I said, this isn’t one of my favorite arcs, but it is the arc where we first get a glimpse of what we’re really in store for. The first four volumes were shorter story arcs, while the Galuna island arc spans several volumes. Long form shonen battle manga may not be for all, but if you’re a fan of the genre this is one of the series you should be reading. You could certainly be doing worse.